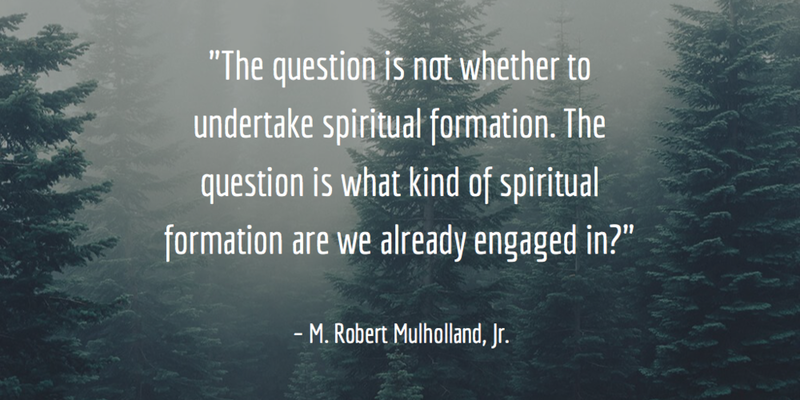 Mulholland: "What Kind of Spiritual Formation are We Already Engaged In?" Shaped by the Word: The Power of Scripture in Spiritual Formation, Rev. ed. (Nashville: Upper Room, 2000), 26. I have never had a moment when I am not being shaped into some kind of person. Neither have you. Maybe this is easier to notice with kids. When they're little, the rate at which they are taking in information from the world and learning new skills is so dramatic, the learning curve so steep, and it's easy to see in any six-month period that their experiences, their choices, their relationships, etc. are shaping who they are becoming. But the person-shaping doesn't stop when we reach adulthood. In fact, it never stops, because as Dr. Mulholland points out in the passage which includes this quote, being in that process is an unavoidable part of what it means to be human. Choosing to write this right now shapes me, and what I will choose to do with the rest of today will shape me. Recognizing that, and paying attention to the process, is what we're talking about with the term "spiritual formation.” My spiritual formation can go well (and if so, we might use the biblical term of transformation), or it can go very poorly (spiritual malformation? ), but it is always going. Who you and I will be forever is the result of this shaping process. We either open ourselves to God’s grace in cooperation in it, or close ourselves to it in either stubborn refusal or plain old distraction. “Spiritual formation is not an option. Spiritual formation is not a discipline just for ‘dedicated disciples.’ It is not a pursuit only for the pious. Spiritual formation is not an activity for the deeply committed alone. It is not a spiritual frill for those with the time and inclination. Spiritual formation is the primal reality of human existence. Every event of life is an experience in spiritual formation. Every action taken, every response made, every dynamic of relationship, every thought held, every emotion allowed: These are the minuscule arenas where, bit by bit, infinitesimal piece by infinitesimal piece, we are shaped into some kind of being. We are being shaped either toward the wholeness of the image of Christ or toward a horribly destructive caricature of that image. This is why Paul urges Christians, ‘Whatever you do, in word or deed, do everything in the name of the Lord Jesus, giving thanks to God the Father through him’. The Christian spiritual journey is a life lived in, through, and for God. *This can be found in multiple places in his teachings. In this case: Shaped by the Word, 25. ** Ibid, 25-26. Italics are Mulholland's.